The $64,000 question on Sunday will be: which Newcastle United side will pitch up at White Hart Lane: the one that beat Chelsea all ends up last weekend, or the one that surrendered the Tyne and Wear Derby the week before that? As so many Newcastle sides have been over the years, this team is woefully inconsistent. Beating José Mourinho’s men showed what they are capable of on a good day, but they so rarely play to their maximum potential that it is easy to forget how much genuine talent dons the black and white stripes every weekend. The reasons for their problems are not hard to spot. They have had bad luck with injuries so far and the squad is not exactly deep. Additionally, strong rumours abound of disruptive Francophone cliques in the dressing room. Finally, it is not unfair to suggest that their manager is, shall we say, not one chosen from the top drawer. All of these things conspire against Newcastle seemingly on a daily basis. Taking that last point first, Alan Pardew remains a divisive figure on Tyneside. Although the Toon Army always supports the footballers on the field of play until the bitter end, their manager has on occasion suffered unduly for his association with the universally despised Mike Ashley regime. The Magpies’ owner is, of course, far from blameless himself, having made a lot of questionable moves since acquiring the club and several of late. His latest blunder has been to take Sir Alex Ferguson’s mantle of Britain’s foremost banner of journalists and carry it as far as he can, feeding a culture of anger and discontent in almost all coverage of his team. Unsurprisingly, protests against Ashley’s ownership are now strictly forbidden at St James Park, and as with all things prohibited, they are becoming increasingly common and prominent. Once again, the unique Geordie brand of dysfunctional in-fighting is seeing Newcastle become the Premier League’s basket case club. Anyway, enough about goings-on in the stands and onto matters on the pitch. Newcastle’s style is hard to define. Their penchant for simple, direct attacks has led to them being labelled in many quarters as unsophisticated kick-and-rushers but the statistics say otherwise: they play the lowest number of long passes per game in the Premier League. Proportionally, only 13% of their passes are long – the same percentage as Tottenham and some way short of the benchmark set by West Ham United. Despite this, only Stoke City and Crystal Palace win more aerial duels per game than Newcastle’s 20.5. This is perhaps a function of having strong penalty-box defenders and towering strikers regularly winning the long balls that they do hit. As Newcastle’s attacks are simple and direct, they often result in a successful outcome. Only three teams take more shots per game. When starved of the ball, their strikers remain alert and on-hand to pepper the goal with speculative snapshots, especially from distance. Oddly, at least for a team that spends a lot of time without the ball, they make an extremely small number of tackles per game – the third lowest number in the division – preferring instead to intercept. Only Manchester United and Swansea City have made more interceptions per game this season. The statistic is slightly skewed by the fact that the ball typically spends a lot of time in the air during Newcastle games – spells in which the ball is headed from defence to defence, for example, racks up a lot of interceptions – but nonetheless it suggests that if the ball stays on the floor then Tottenham are likely to dominate possession as usual. As far as key players go, Loïc Rémy is the man in form and the player they will look to find in behind Michael Dawson and Vlad Chiriches. Yohan Cabaye will take his usual role as midfield conductor, setting the tempo as well as supplying penetrating set-piece deliveries. Full-backs Mathieu Débuchy and Davide Santon provide natural width and attacking impetus, carrying the ball down the touchline and putting it into the danger zone. At the back, the return of Fabricio Coloccini should – in theory – shore up the defence, but the continued presence of professional blundering oaf Mike Williamson suggests that Spurs will inevitably have chances. However, if Pardew chooses to partner Coloccini with Mapou Yanga-Mbiwa then Spurs could find Newcastle’s back four very tough to bypass. The rest of the starting eleven exists to serve and protect those players, really, and does not present a great deal to worry about. In goal, Tim Krul has spells where he plays like a world-beater and others where he would not look out of place on the bench of the Dog & Duck Reserves. The Rumour Mill’s Cheick Tioté will partner Cabaye in the midfield double pivot, providing he shakes off a knock, and will commit the fouls everyone else is too sensible to make and generally do his best to emulate Wearside rival Lee Cattermole. Should he fail to beat his injury, it could be that Moussa Sissoko plays centrally and Hatem Ben Arfa starts on the right. 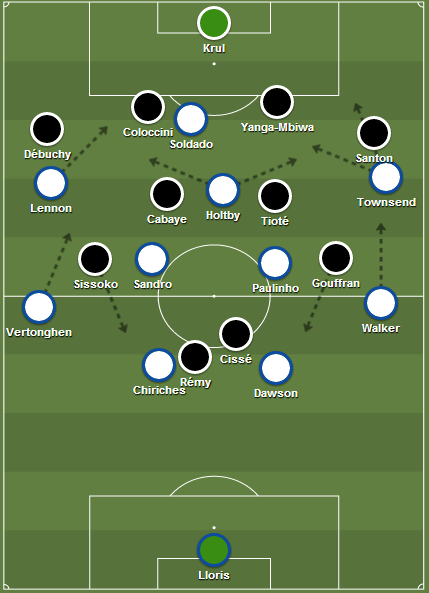 Assuming Tioté plays, it will most likely be Sissoko on the right and Yoann Gouffran on the left. Although they will start wide, expect them to spend a good deal of time overloading the centre of the pitch, looking to win second-balls or finding space in the penalty area as Débuchy and Santon hug the touchline. In many ways, Sissoko and Gouffran have proven typical of Newcastle’s recent signings: both have had memorable moments, scoring winners against Chelsea in this calendar year, but they have been equally notable for their inconsistency. Rémy will look to continue his fine form up front but the selection of his partner will be the question keeping Pardew awake at night. It would perhaps be sensible to play Ben Arfa wide and Sissoko off of Rémy, but that would mean omitting Papiss Cissé for the second week in a row; equally, there must be a temptation to stick with a winning combination and keep Shola Ameobi in the line-up. In any case, Spurs must be at their best defensively. While there is not a great deal of sophistication about Newcastle’s attack, it would be inaccurate to dismiss it as impotent. As with so many Newcastle teams over the years, scoring goals has rarely been a problem: stopping them going in at the other end is where they continually struggle. To that end, André Villas-Boas has to gamble and select the most devastating attacking eleven possible. An early goal or two would probably settle the contest. Additionally, the lack of cohesion in the third band could lead to disaster against Newcastle. Persisting with Aaron Lennon on the left, for example, would be suicide against a full-back like Débuchy. It is time for AVB to put round pegs in round holes and restore White Hart Lane’s confidence with a confident and coherent home display. Given the line-up on Thursday, however, it seems like more of the same is on the way. Expect this match to be another tight one.